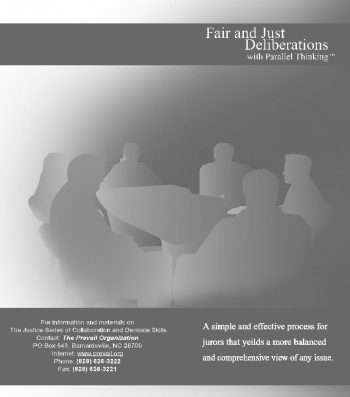 A simple and effective process for jurors that yields a more balanced and comprehensive view of any issue. We have to be willing to admit that we are not capable of figuring things out alone. If our solutions don’t work as well as we want them to, if our explanations don’t feel sufficient, it’s time to began asking others about what they see and think. The Center For Innovative Thinking domain and the Fair and Just Deliberations program are subsidiaries of The Prevail Organization, LLC.